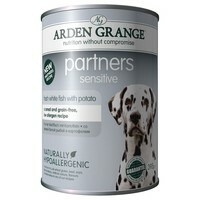 Arden Grange Partners Sensitive Adult Dog Food (White Fish & Potato) is a complete and wholesome wet diet for dogs with sensitive skin, a delicate digestion or dietary intolerance. Containing a high percentage of delicious fresh fish as a nutritious source of easily digestible protein, Arden Grange Partners Sensitive has been made with a cereal and grain free, low allergen recipe that will support your dogs’ skin and coat, whilst being gentle on their digestive system. Arden Grange Partners Sensitive is also a good choice for those looking for a low fat option as it has just 2% fat, and is bursting with vitamins and minerals to provide your dog with the foundations of optimum health.